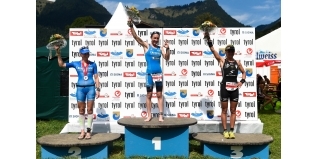 Lucy Gossage kept up the GB women's momentum in long distance racing with a second place at Challenge Walchsee Kaiserwinkl with Catherine Jameson in ninth. After two years of heavy rain, Austria’s spectacular Kaiserwinkl region showed up in all its glory for the sixth edition of CHALLENGEWALCHSEE today. The perfect conditions set the stage for Italy’s Giulio Molinari to regain his title and Simone Braendli (SUI) to take the women’s crown in 3:49:40 and 4:17:56 respectively. In the men's race, a duel between Filip Ospalý (CZE) and Molinari was eagerly anticipiated. However, the Italian went for the win from the beginning. While Ospaly led out out of transition, last year's winner immediately went on the attack, riding from ninth to take the lead in a few short kilometres. Reaching T2 he had expanded his lead over the mountainous 90 km distance to 6:42 ahead of Per Bittner (GER) and Nick Kastelein (AUS) who were just three seconds apart. On the run Kastelein started eating into Molinari’s’ lead closely followed by Bittner and Andreas Giglmayer (AUT) but Molinari crossed the line with still over four minutes in hand. Behind him, the fight for second and third was fierce with Giglmayer finally taking second and the day’s fastest run split (1:15:39) and Bittner third. Women’s defending champion Yvonne van Vlerken (NED), a four-time winner of CHALLENGEWALCHSEE could not make it a fifth win this year. Exiting the water 3:29 down on Catherine Jameson (GBR), van Vlerken didn’t show her usual power on the bike. Over the first 60km of the bike Jameson held a 3:30 lead over her pursuers Lucy Gossage (GBR), Daniela Sämmler (GER), van Vlerken and Braendli. While Sämmler fell back subsequently the trio, led by van Vlerken kept calm and by T2 the pursuers had closed the gap with Braendli taking the lead. Within seconds of each other the top four women headed out onto the run. But that is where the drama ended! Braendli quickly showed her running strength, putting in 1:25 over van Vlerken by the 5km mark and 4:22 by the halfway point. She crossed the line more than seven minutes ahead of second placed Gossage with one of the fastest run splits ever seen at CHALLENGEWALCHSEE (1:20:30). Van Vlerken, rounded out the podium in third.